My name is Katie. I am a full time mother to George and Max, Partner to Rich and part time parent to my partners 3 wonderful children. I live with my 2 boys in Oakington, in South Cambridgeshire. I am a Birth Doula and have been supporting birthing families since completing my training in 2012. I am currently working towards becoming an officially recognised Post-Natal Doula, with a particular interest in Night time support. I have supported many families with their birth wishes, supporting home births, hospital births, birth centre births, water birth, C-section, twin birth and hypnobirthing mums. I have supported many families postnatally in my role as a Calm Family Consultant, teaching BabyCalm and ToddlerCalm in Cambridge and Peterborough. My classes and workshops support parents of newborns and toddlers, covering topics such as normal Infant Sleep Development, Baby Led Weaning and understanding your Toddlers Development (including the frustrating Tantrum Years!) All of my classes are evidence based and it is a real pleasure to share information and hear the positive impact this has on the many families I have supported since becoming a Consultant in 2013. I am looking forward to formalising my postnatal support by becoming a recognised Doula by the end of 2017. I am a breast-feeding peer supporter with a particular interest in tongue tie, having spent a few months working with Sarah Oakley in her Tongue Tie Clinic in Trumpington in 2016. 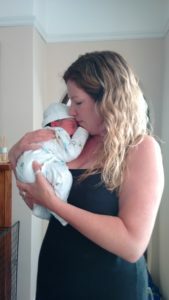 Since becoming a mother in 2007 and completing my training at Developing Doulas in 2012 I have learned so much about birth, breast-feeding and parenting(most of which I didn’t know before my own parenting journey!) I have a real interest in child psychology/development and I love to gently share the information I have learned. It is a real honour to support parents during such a special and life changing time. I am aware of the huge amounts of conflicting information out there surrounding pregnancy, childbirth, and parenting and feel privileged to support parents throughout this time, empowering them to feel confident in the choices they are making, supporting them throughout pregnancy and beyond, by providing the information they need to make informed choices and helping them to remain in control of their own parenting journey. It is the utmost importance to me to support parents to trust their own instincts when it comes to parenting their children. I truly believe all parents very quickly become experts in their own children and with a listening ear and the right gentle support will embrace and enjoy parenthood. I am very passionate about supporting positive birth and sharing positive birth stories. I want every mum to be to know that positive birth is within their reach; their bodies are an amazing piece of machinery, made for the job! I have seen so many powerful women dig deep during pregnancy and labour and I love to empower Mums with the information to trust they will be able to do the same! Positive birth involves different elements for every woman and I am respectful and supportive of whatever type of birth you are planning. I am not there to change your opinion on what positive birth means to you. The most important part of my role as your Doula is the consistent and continued care and emotional support I will provide you and your family during the last weeks of your pregnancy and the 1st weeks of parenthood. I can’t wait to meet you and find out all about your hopes for your baby’s birthday!